Anita Page was a gorgeous blonde who achieved stardom in the silent era, then made the tricky transition to talkies. She was only an extra in her first film, A Kiss for Cinderella, made in 1925 when Page was 15. Within a few years, though, she worked her way to leading lady status, starring in Sam Wood's now-lost Telling the World, playing Joan Crawford's backstabbing flapper friend in Our Dancing Daughters, and sparking police detective Lon Chaney Sr's romantic interest in the action-packed While the City Sleeps. Her first talkie was the first all-sound feature-length musical, Broadway Melody with Bessie Love. It was a huge hit, spawning numerous sequels and rapid sales of sheet music, and the most popular song from the film was "You Were Meant For Me," sung by Page and actually written for her by composer Nacio Herb Brown. The song is still a standard, and has been covered in recent years by Sting and Jewel, among others. Brown was briefly married to Page several years later, and he is best known for writing another memorable tune, "Singin' in the Rain." Broadway Melody was Page's most famous film, but she gave her best performance as the outspoken prostitute who serviced Jean Hersholt in the risqué pre-code drama Skyscraper Souls. She had other successful films, but after having the temerity to ask for a raise she was assigned smaller and smaller parts. When she met the man who would be her second husband, Navy Admiral Herschel House, Page left show business. They newlyweds settled in Coronado, California, where Page and House remained happily married until his death in 1991. Through her long retirement from films, she made occasional appearances at screenings of her old films, and in 1996 she was lured from retirement to appear in Sunset After Dark with former child star Margaret O'Brien. 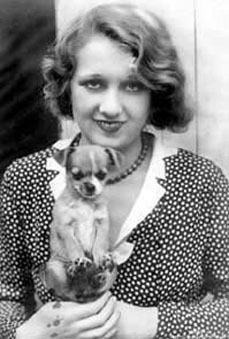 Page subsequently appeared in several more low-budget films, including Bob's Night Out with Tommy Bond, who had been one of the Little Rascals in the 1930s. During her time as a major star, Page was romantically linked to William Haines, her co-star in six films, and to Hollywood's silent-era Ben Hur, Ramon Novarro. Both men proposed marriage to Page, both were spurned, and both men were later revealed to be gay. Hollywood Walk of Fame 6104 Hollywood Blvd.